Wilton Cake Decorating Course Update II: Cake – amandarobots. The buttercream recipe we were instructed to use is for Wilton’s Class Buttercream. Instead of butter, it contains vegetable shortening, which isn’t as quick to melt at room- or body-temperature. It also has meringue powder, which is essentially powdered egg whites. This helps to bind the icing together and help it set, which lets you smooth it and put cool decorations on it. The first thing we were taught is how to tort the cake, which is just fancy way of saying “slice-it-in-half-lengthwise-to-fill-it-with-something-delicious”. I went with buttercream, but some people used fruit, preserves, or pudding. After cutting the cake in half, I used a cake circle to lift the top off and set it aside. When I was done filling it, I just put the top back on. Then it was time to ice the cake smooth, which is a hellish task from hell. It’s my least favourite thing we’ve had to do so far but unfortunately, it’s probably the most necessary. Let me tell you, it is incredibly difficult to get your icing smooth, even, and free of crumbs. What’s fun is that my instructor told us all that we have to look at photos of cakes in books or on websites the way you’d look at People Magazine: it’s all fake. The “cake” in that photo is probably made of styrofoam; the “buttercream” used to ice it is probably royal icing (which is just icing sugar, water, and meringue powder, and a helluva lot easier to work with than buttercream) or fondant; and they’re made by professionals whose job is making cakes look good and not really worrying about how they taste. We talked a lot about having reasonable expectations of our own cakes. While the icing on the cakes set, we learned a few new decorating techniques: dots, pulled dots, star-fill-ins, and elongated shapes. We also learned a life-saving cake-smoothing technique: once the icing has set (meaning there’s a lightly crusty layer on it), you put take a piece of parchment paper on top of your cake and smooth your icing through it. Genius, I tell you. Then it was time for the piping gel transfer. Piping gel is coloured (or clear) gel that comes in a tube or pot and that you can use for decorating, or to trance patterns and transfer them to your cake. I transferred a cupcake to mine. I made some mistakes when filling it in; I wasn’t 100% able to cover the piping gel, so it’s still peeking through around the edges of my design. But this is a really cool way to get images onto a cake. I filled the cupcake with a combination of elongated shapes and stars, and a big dot for the cherry. 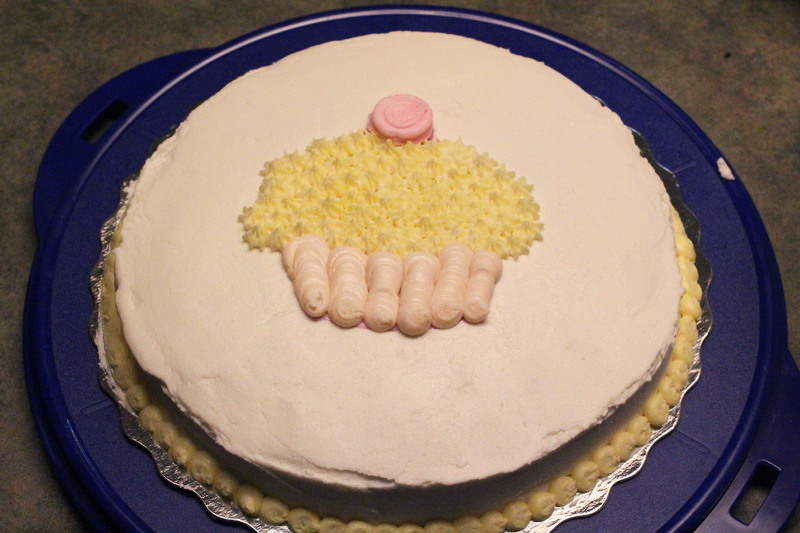 I used a whole bunch of little dots to make a border around the base of the cake, too. I’d say it was a successful week! I’m much more confident in my icing-making abilities, and torting the cake was scary but fun. One thing’s for sure though: I will always dread icing a cake smooth. Stupid crumbs.